This is Mark, he is a Real Change vendor in my neighborhood. He is one of the friendliest people I know. Whenever I see him I make sure to purchase a paper from him. I usually get two because he is so polite and I love seeing him around the area. Not everyone who is houseless suffers from Mental Illness or Drug/Substance Addiction. Unfortunate circumstances could occur to any one of us that would turn our lives upside down and potentially land us in his situation. Despite his situation he maintains his positive attitude and outlook almost indefinitely. It's incredibly inspiring and very admirable. Real Change is a local news publication that assists houseless/low income individuals in getting back on their feet by providing them with a job selling their newspaper and in return they get to keep a generous percentage of their total individual sales. Costing just $2 a piece for the paper it's a worthy contribution to make and I truly beleive that it does make a Real Change as the name indicates. Meet Larry, he is a local Real Change vendor who has been here since 1981, he moved from Texas here to Seattle. 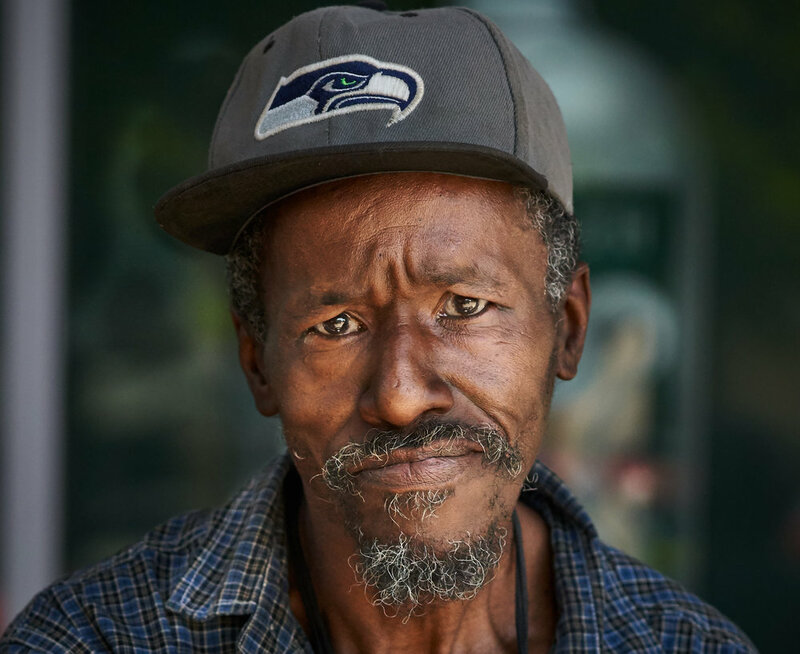 I sat down with Larry and had a discussion with him about his life and the heat that Seattle is experiencing at the moment. I personally prefer the heat, and we had a laugh about him being from Texas and how people like to complain about the heat in the Summer here. As you know it gets very hot in Texas. I asked him if he ever missed Texas and he said "Everybody misses home from time to time." Thanks for your time Larry and for doing what you do. Went out today for an exciting shoot with the Sony Gmaster 85mm 1.4 on a Sony Alpha A7RIII and model Chance Boley down into the International District here in Seattle. I am currently sorting through the images, and will be posting them staggered here and there on Instagram @matthewrstuber. Keep an eye out!